To start go to Admin.php in your browser. You will be required to login. The username is 'admin' and the default password is 'events'. You should click on 'change password' under the Admin title to change the password to your own password. Admin shows a list of the current events together with their status and the different management options available. The first thing you will want to do is Create a New Event and upload the photos from the event. Type in the name of your event into the Create Event Field and hit 'Submit'. You will be taken to the upload screen and the Pluploader will appear. Choose 'Add Files' and Browse to pictures you want to upload. They must be JPEG files (not TIF or RAW). Click Upload to start the upload. By default the uploaded pictures will be resized to 600 pixels high. Though the uploader will resize the pictures uploading files can take a long time, so it is a good idea to make sure that pictures have been resized and/or compressed before uploading using Photoshop or similar software. Once uploading is complete it automatically goes to the Initial Catalogue page. 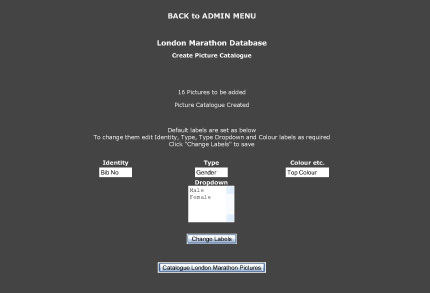 Once you have uploaded the pictures the The Initial Catalogue page will display the default labels and dropdown menu. 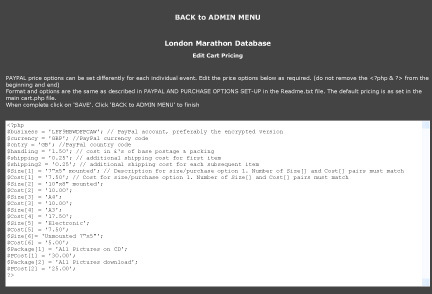 You can edit them if you want to customise the event or you can go directly to the Catalogue section or back to Admin. In Admin you will see the event listed with its status and a series of options. Pics/Cat shows the number of pictures in the event catalogue and how many have been catalogued already. Catalogue will show as the first option until all the pictures have been viewed and catalogued in some way. Catalogue always starts at the first picture that has not already been catalogued. For each picture you can choose to add an Id, Type and Colour (according to labels set in the config e.g. Bib No, Gender, Top Colour) for any participant shown in the picture. Once you have added one participant's details for a picture you can either go on to the Next picture or Return to the current picture and add another participant's details. With the $CatFast option set to true the Catalogue page just has one field for the Id (e.g. Bib No.). It can be a list of Id's separated by commas and so is a lot faster for images with multiple participants. You can leave Cataloguing an event at any time. When you return it will continue from where you left off. 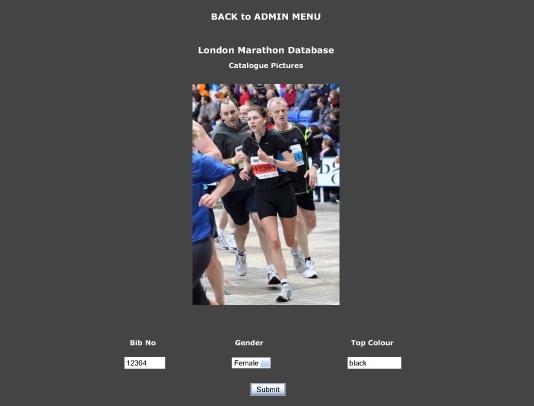 When you have been through every picture the Admin option will change from Catalogue to Review. **NB V2.0 now supports multi-user cataloguing. Any number of users can be cataloguing an event at one time. If a picture is being viewed by a user it is locked from viewing by others. Review is similar to catalogue but you can step through the pictures or Find a particular one to check them or alter the details. For a picture you have the options to Add further participants' details or Edit existing details. PUBLISH Once you are happy with the cataloguing for an event you can choose the Publish option on the Admin page. The Event will then appear automatically on the public index.php page. If you change your mind at any time you can choose Un-publish. 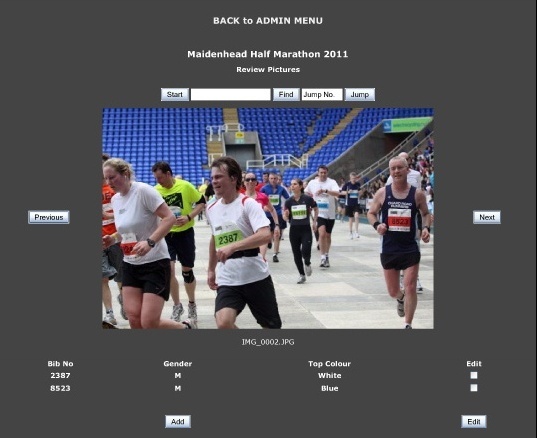 If you want you can Publish an event before completing the catalogue. 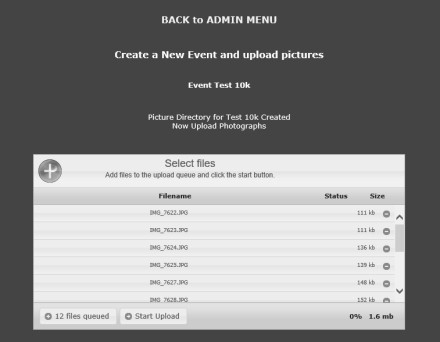 ADD PICTURES You can at any time add more pictures to an event. If you do, the Catalogue/Review button will revert to Catalogue and the event will be Unpublished if already Published. As with the Create Event if you haven't installed a TWG licence (see above) an 'Add to Catalogue' button appears under the Uploader. IMPORT PARTICIPANTS LIST Many events provide a list of the participants' names and their event Id numbers etc. If you have that available you can upload it here. The format of the file to be uploaded has to follow an EXACT format. IF it doesn't it won't work. Get the participants list as a Excel or other spreadsheet. The columns must be in the following precise order ID No, First Name, Surname, Gender. (most events seem to use this order) There must only be these 4 columns in that order. Delete any others. Delete any header row. Save the spreadsheet using 'Save As' as a CSV (Comma Separated File) choosing ',' as the separator. You can now upload the csv file . If it doesn't work you can choose delete participants file from the Admin for the event. WATERMARK ON/OFF V2.0 allows the watermark to be toggled on and off for each individual event. The default is as set in pme_config.php. If at any time you change to a new watermark file toggling the watermark off and then on again will regenerate the thumbnails with the new watermark. V2.0 allows the PAYPAL price options to be set differently for each individual event. Clicking on the Edit button opens up the cart file for that event to be edited. Format and options are the same as described in PAYPAL AND PURCHASE OPTIONS SET-UP above. The default as set in the main cart.php file. 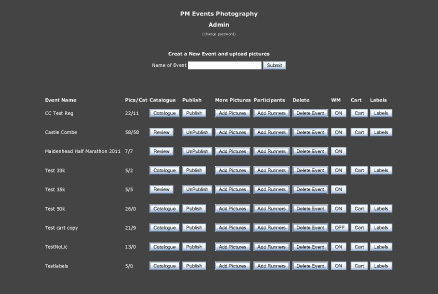 V2.0 allows the display labels for each event to edited to tailor them to each event. Click on the 'Labels' button to display the current labels and dropdown menu. Edit them as desired and click 'Change Labels' to save. Does what it says. You will be asked to confirm before proceeding. It will delete the all the event's catalogues, participants list and ALL the pictures for the event.